The Strokes are an American rock band formed in 1998 in New York City. 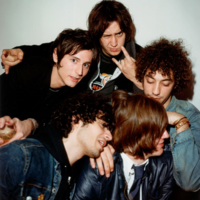 Its members are Julian Casablancas (lead vocals), Nick Valensi (guitar), Albert Hammond, Jr. (guitar), Nikolai Fraiture (bass guitar) and Fabrizio Moretti (drums and percussion). Upon the release of their debut album Is This It in 2001, the group met much critical acclaim.NME made Is This It their Album of the Decade. Since then, the band has maintained a large fan base, mostly in the UK, US, Canada and Australia. A number of members have embarked on a variety of side projects, although a fourth album, entitled Angles, is in preparation for release on March 22, 2011.